Hi, I'm Dunise. I’m a Scottish breast cancer patient. 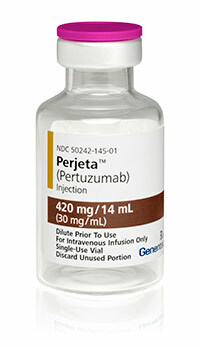 Right now I’m getting access to pertuzumab (Perjeta) because I live in England. But Roche’s demand for an extremely high price means it is not available in Scotland, so I can’t go back to be with my family whilst I get treatment. Most Scottish patients don’t have access at all. I want the Scottish government to use their power to stand up to Roche and demand a fair price. Please add your support for all breast cancer patients by signing my petition. Nicola Sturgeon, please stand up to Roche. Use your power to issue a Crown use licence on pertuzumab (Perjeta) so Scottish breast cancer patients can get this important medicine at a price the NHS can afford. Pertuzumab (brand name Perjeta) is an effective breast cancer drug but the manufacturer, Roche, is charging a price so high – over £40,000 - that, NHS Scotland can’t afford it. As a result Scottish cancer patients are missing out on a medicine that could give them vital extra months of life – or trying to find the tens of thousands of pounds needed to pay for it themselves. The drug company, Roche, are able to demand this extremely high price because they have a monopoly meaning no one else is able to make or sell the medicine. But when companies abuse their monopoly like this there are legal safeguards designed to protect public health, and to make sure patients’ lives come before pharma company profits. One such safeguard is known as a Crown use licence. It allows the government to give permission to another manufacturer to make and supply the drug to the NHS at a price we can afford. With Roche making billions of pounds in profits every year, and Scottish cancer patients dying without access, we are calling on the Scottish government to use their power to break Roche’s monopoly and ensure every patient that needs pertuzumab can get it. What is a crown use licence? When a new medicine is developed drug companies usually apply for a patent. This gives them a twenty year monopoly during which time no one else can make or sell the medicine. The global rules around patents are set out in a World Trade Organisation agreement known as TRIPs (Trade-related Aspects of Intellectual Property Rights). When it was agreed, governments realised that the rules within TRIPs could prevent people from accessing the medicines they need, so they built in a safeguard to ensure patents didn’t prevent people from accessing the medicines they need. One of these safeguards is known as a compulsory licence – or in UK law a Crown use licence. This law gives the government the power to grant another manufacturer permission to produce an identical copy of a patented medicine. It is designed to stop drug companies from abusing their monopoly by charging unaffordable prices. Has a Crown use licence been used in the UK before? Yes. In 1991, the UK government authorised the supply of machines known as lithotriptors, for treating kidney stones, under the Crown use provisions of the Patent Act 1977. In 1995, the UK Department for Health raised the possibility of using Crown use provisions on pharma company Chiron’s hepatitis C (HCV) diagnostics. Chiron acknowledged the pressure that this placed on them to voluntarily licence. Didn’t Roche spend loads developing the drug? Pharmaceutical companies are cagey about the true research and development (R&D) costs of bringing a new drug to market, making it very hard to know what was actually spent on a drug. There is a huge lack of transparency around the issue, and claims that it costs $2.6bn to develop a new drug have been widely discredited. Non-profit research and development organisation the Drugs for Neglected Diseases Initiative (DNDi) say that it costs a maximum of €150m to develop a new chemical entity. In the case of pertuzumab, the basic research underpinning pertuzumab was funded by the UK taxpayer. So right now we’re paying twice - first for its’ initial development, then to buy back the drug at a hugely inflated price. What’s more, Roche are making a killing out of his drug: pertuzumab generated sales for Roche of £1.44bn in 2016 alone and these sales are expected to grow to £3.5bn a year by 2020. In the same year the CEO of Roche, Severin Schwan, received a pay package of £8.9m. Who would benefit from this drug? Around 426 patients in Scotland could benefit from the drug each year through neoadjuvant use.1 Between 244 and 983 patients could benefit from the drug each year to treat metastatic breast cancer.2 All these patients are currently being denied access. What has happened so far in the negotiations between Roche and the Scottish Medicines Consortium (SMC)? In December 2016 the Scottish Medicines Consortium (SMC) - who make decisions on medicine approvals for NHS Scotland - rejected pertuzumab for neoadjuvant (pre-surgery) use because of the high price. In June 2017 the SMC turned down pertuzumab for metastatic breast cancer for the third time because of a lack of cost-effectiveness. The Scottish government, the NHS and Roche are currently in talks over pricing. What’s the situation in the rest of the UK?